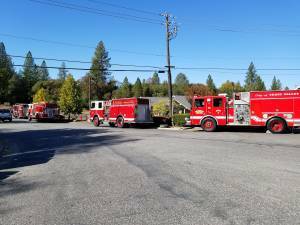 November 8, 2018 – Nevada County Consolidated Engine 88 and Grass Valley Engine 2B deployed as part of a County of Nevada Strike Team to the Camp Incident in Butte County. Engines of Strike Team 4105A assemble for briefing prior to departing for the Camp Incident in Butte Co.
Ophir Hill Engine 5269, Peardale Engine 57, and Higgins Engine 21 complete the Strike Team led by Battalion 2. The Strike Team of 5 Engines and the Strike Team Leader have arrived at the incident. The JOA remains fully staffed.